Cole is an aspiring DJ who spends his days scheming with his childhood friends and his nights working on the one track that will set the world on fire. All of this changes when he meets a charismatic but damaged older DJ named James, who takes him under his wing. Things get complicated, however, when Cole starts falling for James’ much younger girlfriend, Sophie. With Cole’s forbidden relationship intensifying and his friendships unraveling, he must choose between love, loyalty, and the future he is destined for. I will be lying if I said I didn’t catch this movie on the first day of screening because of Zac Efron. Since High School Musical, this is perhaps the closest he has come to doing something related to music again. As I’ve been dreaming about venturing into the Hollywood, this film is giving me a glimpse of what it is like in Los Angelas without flying there. Zac Efron as Cole Carter, is the young Dj wannabe who aspire to become famous. While he was not as crazy as his friends, the actor-wannabe Ollie (Shiloh Fernandez), big-deal chaser Mason (Jonny Weston), and Squirrel (Alex Shaffer), he was VERY LUCKY to be picked off the alley by famous veteran DJ James Reed (Wes Bentley). Cole reminded me of the in-between kid situation that Beca Mitchell (Anna Kendrick) was in back in Pitch Perfect. While I anticipated watching the film, I can’t help but be a little disappointed. I mean, it’s pretty good, not wow, but more of an ok-good. So what went wrong and what’s missing? Love at first sight? Don’t get me wrong. Emily Ratajkowski as Sophie is gorgeous, especially in her low cut blouse. But she’s definitely not the type who gets guys going ga-ga at the first glance. And her chemistry with Cole somehow seem off and stale. On the other hand, it was interesting watching Cole trying to impress Sophie with his scientific theory of getting the crowd up to 128 heart-beats per minute to control the audience’s entire circulation system (which I don’t know how true in the DJ world), and Zac Efron DID control my system at that very moment. I was nodding to the beats, and wanting to get some dance. I don’t have much to say about the love-triangle between Cole, James and Sophie. It was well performed, I was mildly entertained, and the animation effect achieved by rotoscoping, showed Cole’s hallucinations in an art gallery after he was drugged was interesting enough. Perhaps electronic music wasn’t my cup of tea, other than the track Cole Carter play at James Reed’s pool party and his music festival creation, the rest was forgettable. Better music is needed. At least for me. In preparation for his role as a DJ, Zac Efron received lessons on DJing and mixing from DJ Alesso. Max Joseph was forced to miss out on appearing in the first five episodes of the fourth season of his series, Catfish: The TV Show (2012), in order to direct the film. Check out We Are Your Friends (WAYF)Official Website and Facebook Page! 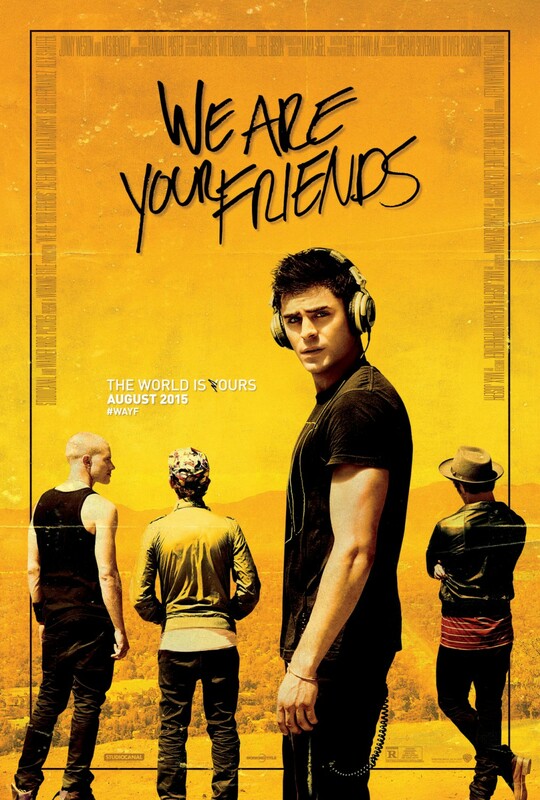 We Are Your Friends (WAYF) is out in cinemas on 24th September 2015. When looking at the poster, i thought it is a concert poster.. haha.. thanks for sharing! Zac Efron is getting hotter as he ages. Look at those abs :p Although I’m not sure if I would love to watch this in the movies. I think this is more on Zac’s comfort zone when it comes to movies. It seems like a good watch. I would love to watch this kind of fun movie it makes you feel young and Zac is looking nice. I did saw the trailer and I didn’t really find it catchy at all, apart from the fact that THE Zac Efron is there. I guess that’s the only thing that would make the movie click (if it would click at all). I would be lying too if I said I’ll be watching this movie because of the story it can tell me. Haha! Because definitely, I’ll be watching this because Zac is in there! Haha. Being a DJ looks easy but its as hard as what sales persons do; they need to sell something while DJ’s have to sell their music by making people dance to it. And that’s seriously not an easy thing to do. It would be great to watch the film to also have a glimpse of what a DJ’s life usually look like. The first thing I thought was Becca from Pitch Perfect too. I know a lot of Zac’s fans, they are a lot! I’m sure this will be a hit whether or not, the story is good. Hehe. A good movie for teenagers (espcially for girls!) I guess? 🙂 I like Zac Efron way back in High School Musical but after that, nada! Thanks for sharing your review by the way! Sounds like a movie that teens will go crazy for. Zac’s been doing good with his acting, this is another role that would attest to that. Zac Efron just gets better as he gets older. I think I’d watch this for him. Haha. We all watch it for Zac!